The name Star Trek conjures images of faster-than-light spacecraft, holographic crew members, and phasers set to stun. Some of these incredible devices may still be far from our reach, but others have made the leap from science fiction to science fact, and now you can learn the science and engineering of what makes them tick. 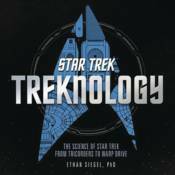 Treknology looks at over twenty-five iconic inventions from the complete history of the Star Trek television and film universe. Author Ethan Siegel explores and profiles these dazzling technologies and their role Star Trek, the science behind how they work, and how close we are to achieving them in the real world today.